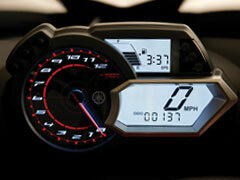 Feature THE YAMAHA ADVANTAGE Comfort - Consumer Products | YAMAHA MOTOR CO., LTD. These are navigation skip for main content and footer menu. Yamaha is devoted to comfort that doesn't stress the body or the mind of the rider. But the real aim is to make people feel that they just want to keep on riding and enjoying it. For the ride of a snowmobile to be truly pleasurable and comfortable, it is important that the machine responds to the will of the rider. The ideal is for the throttle and the handlebars to feel like extensions of your own body as you accelerate, decelerate and steer the machine. To achieve this kind of rider-machine unity, Yamaha Motor is now focusing especially on electronic control technology. Examples include idling speed control (ISC) to ensure stable idling rpm even in the thin air of higher altitudes or in extreme cold, fuel injection that helps ensure stable, finely tuned acceleration, and EXUP for smooth power development without exhaust blow-back. Another is electronic power steering (EPS), which Yamaha Motor now brings to snowmobiles for the first time in the industry. EPS lightens the effort of steering and helps reduce the fatigue that comes from the jerking of the handlebars when riding on rough terrain. Systems like these help narrow the gap between the rider's intentions and the actual motion of the machine and thus enhance the feeling of rider-machine unity in ways that couldn't be achieved with conventional analog technology. With a snowmobile you want smooth, linear response from start-ups, through acceleration and cornering. If the ride is jerky and not smooth it causes undue fatigue and stress for the rider, and that makes it harder to concentrate on your riding. 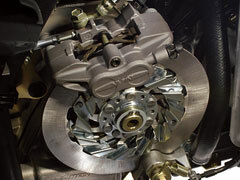 There are a number of major factors that influence this, and one of them is CVT clutch feeling. The role of the CVT unit is to change the effective gear ratio in accordance with the engine rpm in a stepless continuum that provides a smooth ride. The feeling of this transmission function has a big effect on the machine's running performance. Development attention focuses on achieving a quality of machine reaction to the rider's throttle work that feels as natural as possible to human sensitivities and responds faithfully to the will of the rider. This is achieved by painstakingly adjusting the CVT character, engine performance and the drive train to the right balance. 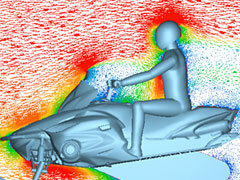 This is how Yamaha snowmobiles achieve a natural and enjoyable feeling to the handling and the ride. Yamaha Motor has a unique approach about the ideal brake feeling. When Yamaha develops the braking performance, our concern is not just for braking force in terms of numbers. We also focus on the feeling of rider-machine unity it gives. One of the important factors in this is the engine brake characteristics. We develop the settings in a way that makes the strong engine brake effect inherent to a 4-stroke feel more natural to the rider and also improves the way the machine handles. As for the hand brakes, the relationship of the "input" components (levers, etc.) and the "friction-making" components (pads, etc.) 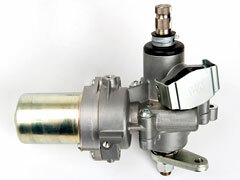 is optimized to create a well-modulated, high-quality brake feeling. The basic aim of the braking function is to give the rider the assurance that they can stop with certainty when they want to. In addition to this, Yamaha Motor works to optimize not only the shape of the brake lever and the brake touch but also the braking feeling and the vibration that occurs when the brakes are applied, all with the aim of building snowmobiles that reduce rider fatigue and make them feel like riding longer and enjoying their rides more. For Yamaha, these are all factors that can contribute to the enjoyment of riding. The central component providing wind protection for the rider is the windscreen, and the standard method for increasing the wind protection effect is increasing the surface area of the forward-projecting portion of the screen. However, simply increasing the projected surface area can detract from running performance due to factors like increased wind resistance and swirl-in effect. Also, the windscreen is a part that defines the machine's exterior look, if it is too large it can affect the styling and the rider's field of vision. In other words, the wind protection performance, the running (aerodynamic) performance and the styling is a three-way relationship that requires a fine mix of development know-how to balance. In the design process, fluid (aerodynamic) analysis, strength analysis and wind-tunnel tests are used to achieve ideal function with the engineers and designers working in close communication to create the right form using the most suitable materials. These efforts result in styling that is unified with the lines and 3-dimensional form of the body and organic surface composition that provides outstanding wind protection. Yamaha wind protection is designed to offer a high level combination of good looks and functionality through design that embodies the ideal of "visualization of function." 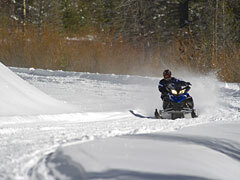 How many times do you start the engine of your snowmobile in a day? All Yamaha 4-stroke models have electric starters. Most of the Yamaha 4-stroke models are equipped with electronic fuel injection (FI), and some of them even have automatic ISC. The switches are grouped together near the handlebar grip to allow all the start and stop operations to be performed swiftly and surely. The LCD display is designed to provide the rider with a variety of information with excellent visibility and liquid crystal technology that ensures excellent function even at low temperatures. Yamaha Motor believes that convenience in daily use is an important factor in rider comfort and enjoyment. That is why we envision a long snowmobile life and do everything possible to remove potential stress factors and maximize assurance. Our focus on comfort and enjoyment comes from these types of development ideals. Yamaha Motor believes that the sound generated by the running of a machine is another element of comfort and enjoyment, and we make concerted efforts in the area of sound quality. 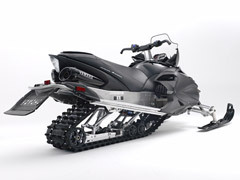 The snowmobile's sound is a complex mix of components. The engine cover has little noise-reduction effect because of the air vents for circulation to cool the engine. Furthermore, due to the high percentage of use at high rpm, the engine sound is composed primarily of high-frequency sound. Given these factors, if quietness was the only aim it would be most effective to take measures like increasing the rigidity of the crankcase and the volume of the muffler. Of course, these elements are included in the basic design. Yamaha Motor doesn't focus simply on reducing the volume of engine noise, however. We work to develop a sound that suits each specific model and its use. The development involves analysis technology, but in the end it is the trained development staff, in other words, human ears-that makes the final decisions in fine-tuning the sound. The aim is not simply quietness. That is why the sound of a Yamaha snowmobile is the type that makes you want to ride on and on.